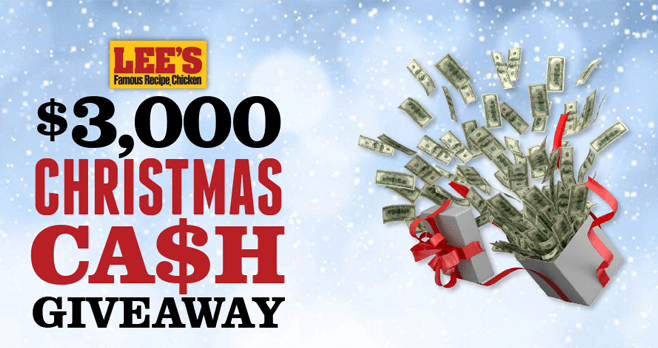 This season, make the Holidays famous with Lee’s $3,000 Christmas Cash Giveaway 2017. Register for the Sweepstakes by December 6th and you could win $3,000 cash. Enter daily for more chances to win. To enter the 2017 Lee’s Famous Recipe Chicken Christmas Cash Giveaway, visit www.leesfamousrecipe.com/christmascash2017 and complete the entry form and submit as directed. There is a limit of one entry per person per calendar day during the Sweepstakes Period. The Giveaway begins at 10:00 am ET on November 6, 2017 and ends at 10:00 pm ET on December 6, 2017. On or about 12/10/17, a random drawing will be conducted by Administrator from among all eligible entries received. The Grand Prize consists of $3,000 cash, to be awarded as a check in winner’s name. N. Eglin Parkway, Suite C-14, Shalimar, FL 32579.
thanks for the opportunity to try to win, thanks again!